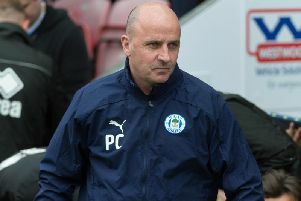 Wigan Athletic have confirmed some changes to Paul Cook’s backroom staff. Andrew Procter, Nick Meace, Nick Colgan and Anthony Barry have joined ahead of their League One campaign. New head of medical Procter – a former midfielder with more than 500 career games – and head of sports science Meace were both with Cook at Portsmouth. They join existing sports scientists Adam Forrest and physio Marcus Quarmby. Colgan joins as goalkeeping coach from Huddersfield Town, who were promoted to the top-flight in the summer. And Barry has been appointed as first team coach. Cook had already appointed Leam Richardson as assistant manager while Peter Reid has helped out on a voluntary basis. First-team coach Graham Barrow ended his long-association with Wigan Athletic following their relegation from the Championship in the summer. James Barrow (fitness), Dan Connor (goalkeeping), Michael McBride (physio) and Gaz Piper (strength and conditioning) also departed.